Yarn (I used I Love This Cotton. I typically use I Love This Yarn.. any type of worsted weight or cotton yarn should work okay). 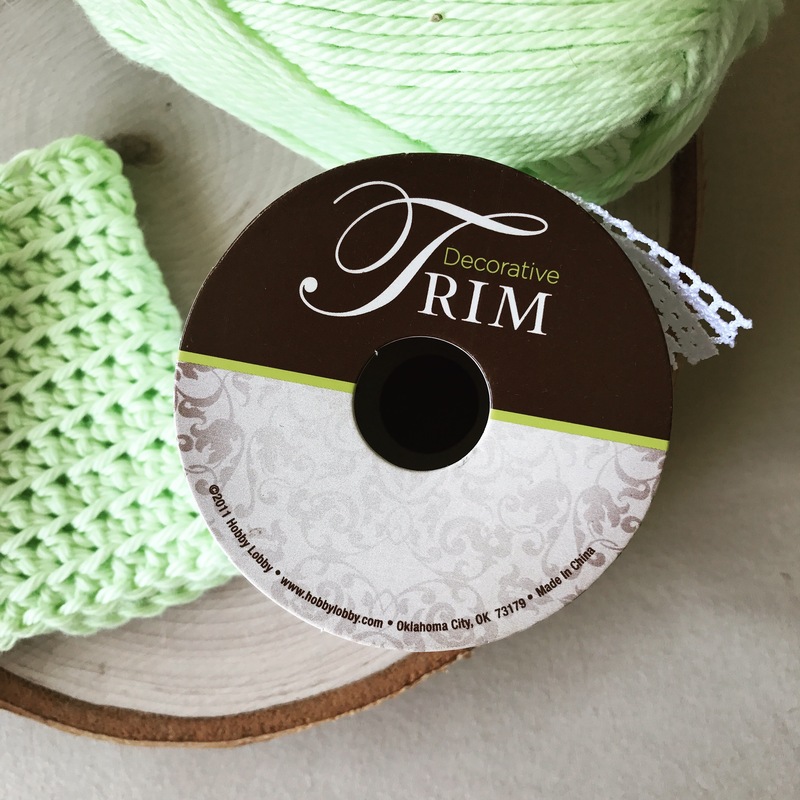 Trim Decorative Ribbon (can be found in the ribbon department at Hobby Lobby near the fabric.. see bottom of the tutorial for ribbon suggestions & tips). 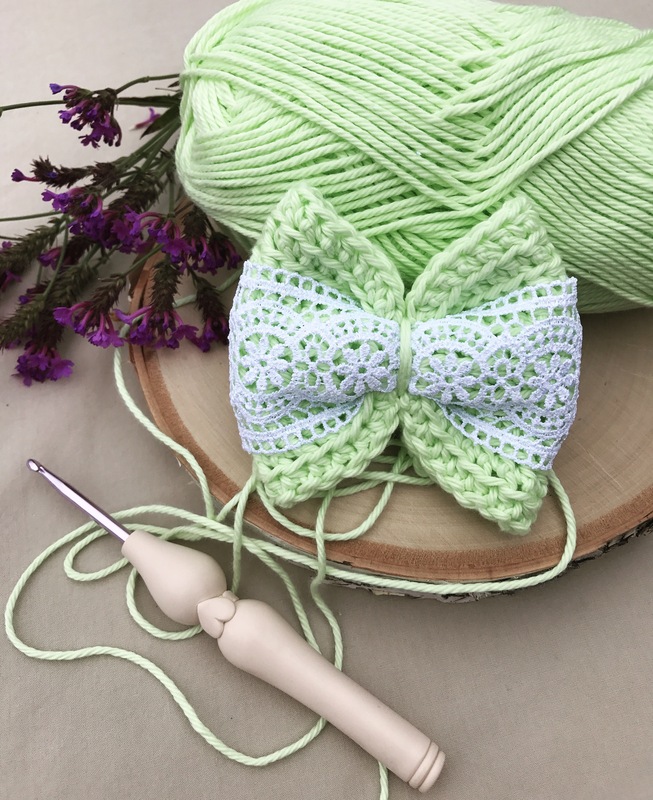 I use a small Southern Style bow for this tutorial and the majority of ribbon bows that I make. 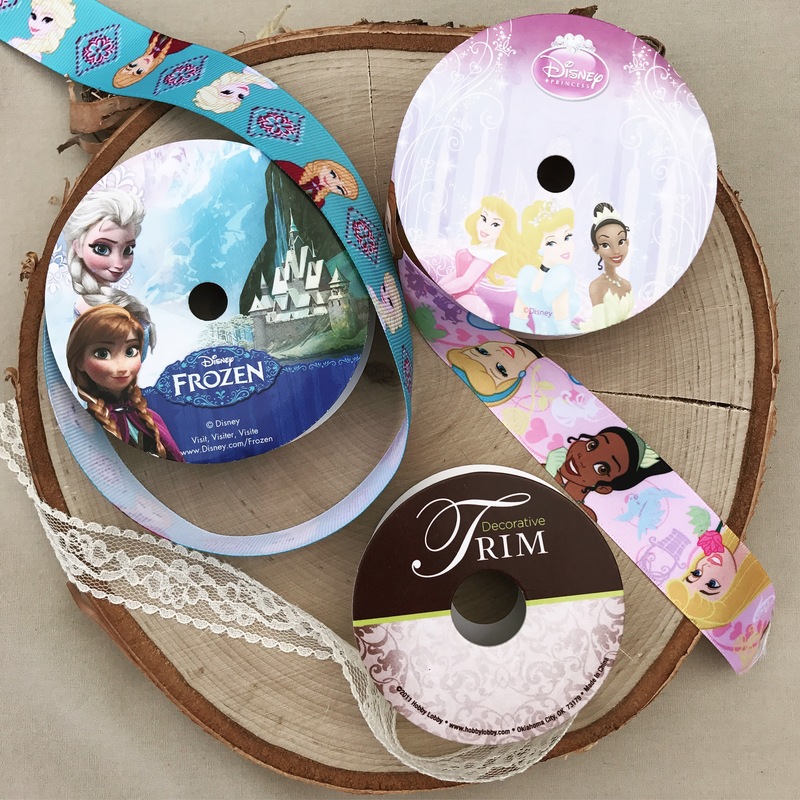 The size ribbon pictured above (1-7/8 in) is what I’ve found works best. 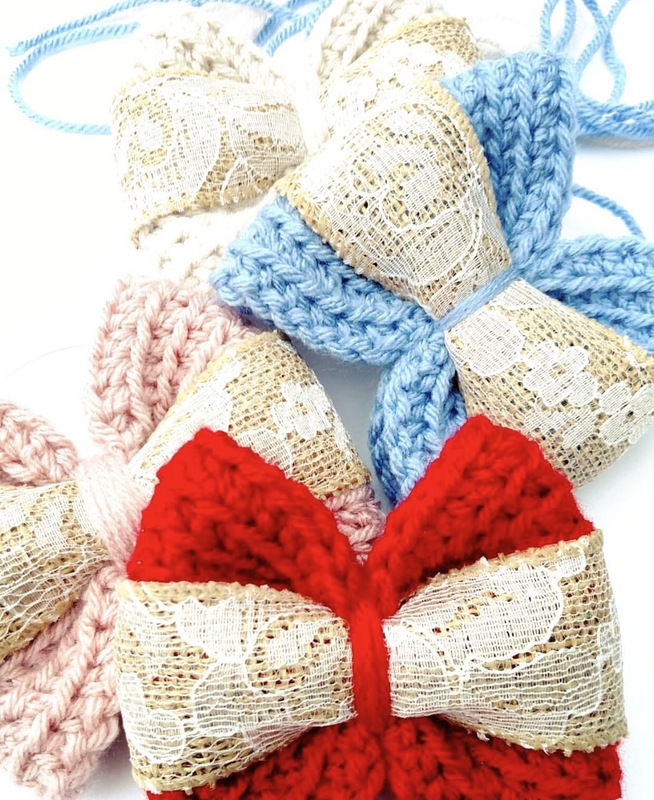 I’ve also used 1″ ribbon and smaller ribbon for the baby bows.. I’ll cover that at the bottom of the tutorial. I cut the ribbon long enough that it overlaps about an inch at the back of the bow. 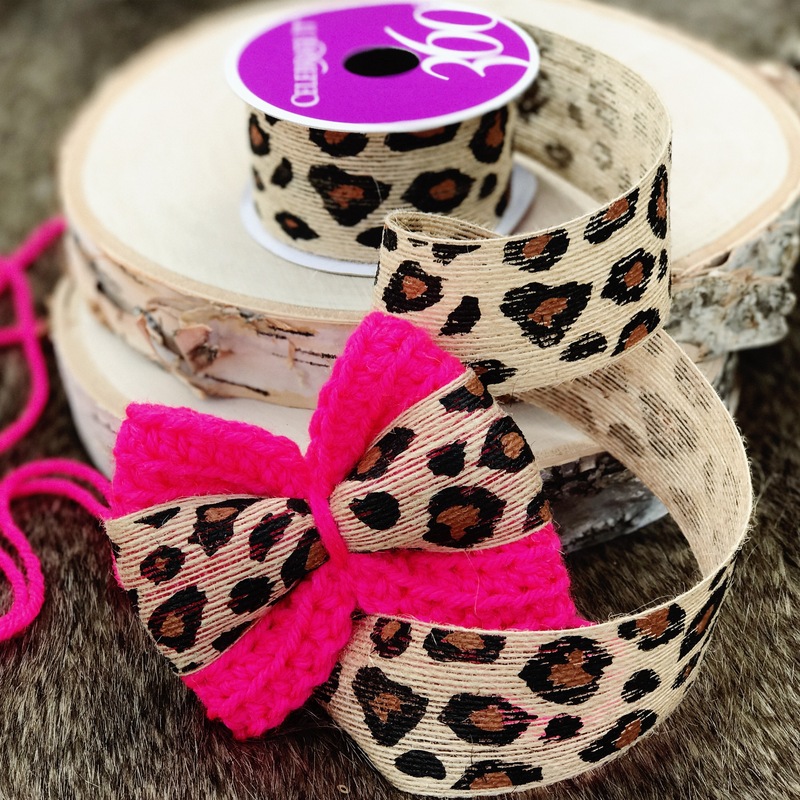 This allows the ribbon to be sewn to the bow securely. Too much excess ribbon may cause the bow to be bulky. 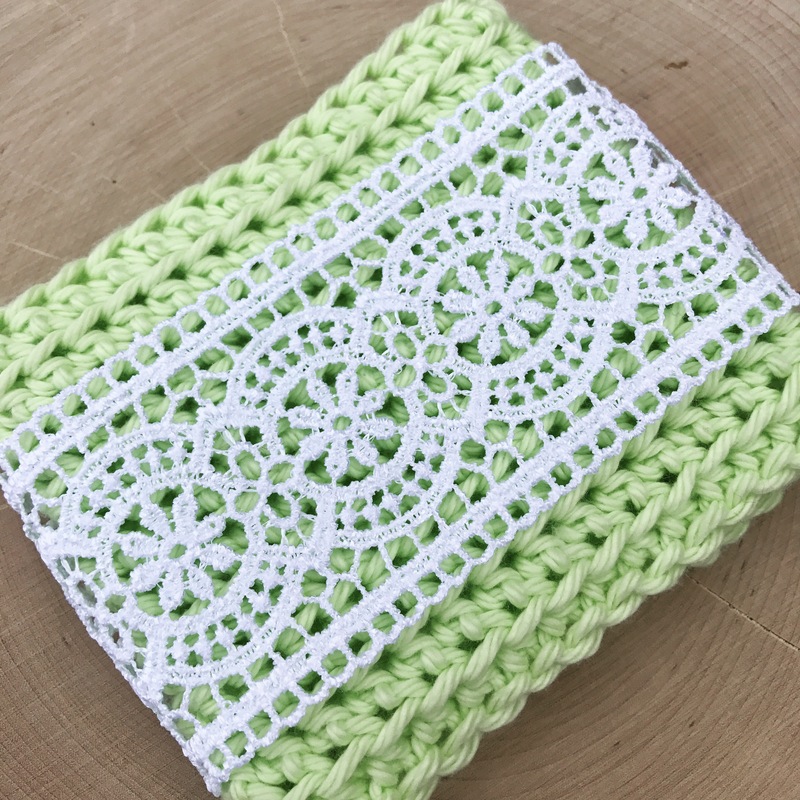 I used cotton for this tutorial. 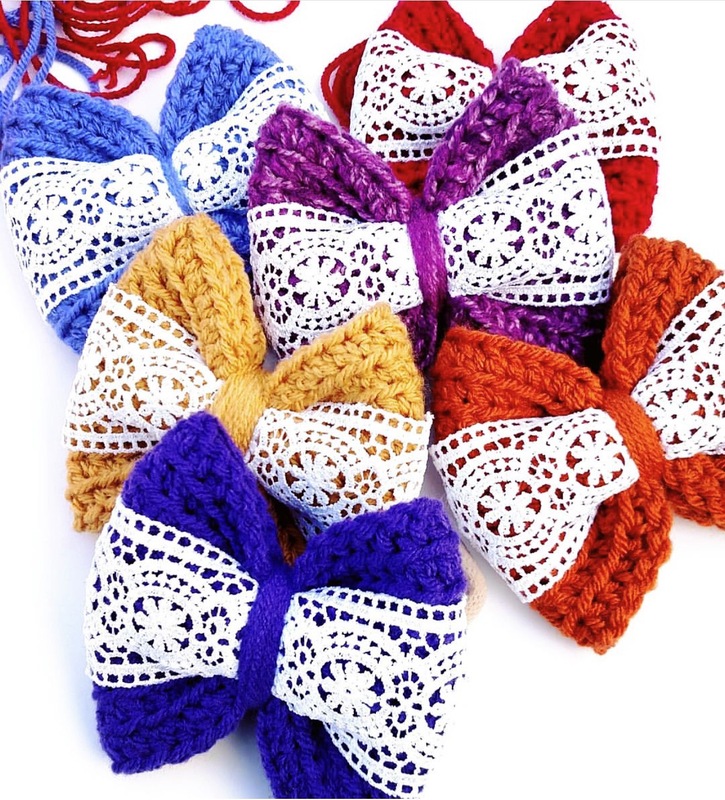 I recommend beginning with a bow made from acrylic yarn for your first time. It’s much easier to work with for this particular design. After sewing the ribbon onto the bow, I tie the bow just as I do in the “Southern Style Bow” tutorial. 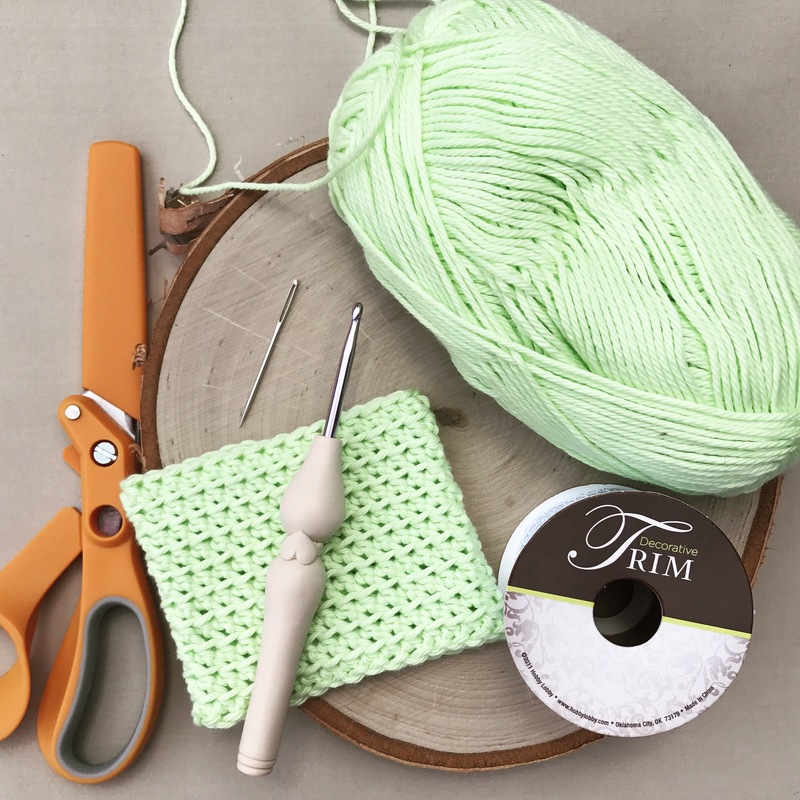 Join last stitch with first stitch by using a slip stitch as shown below. 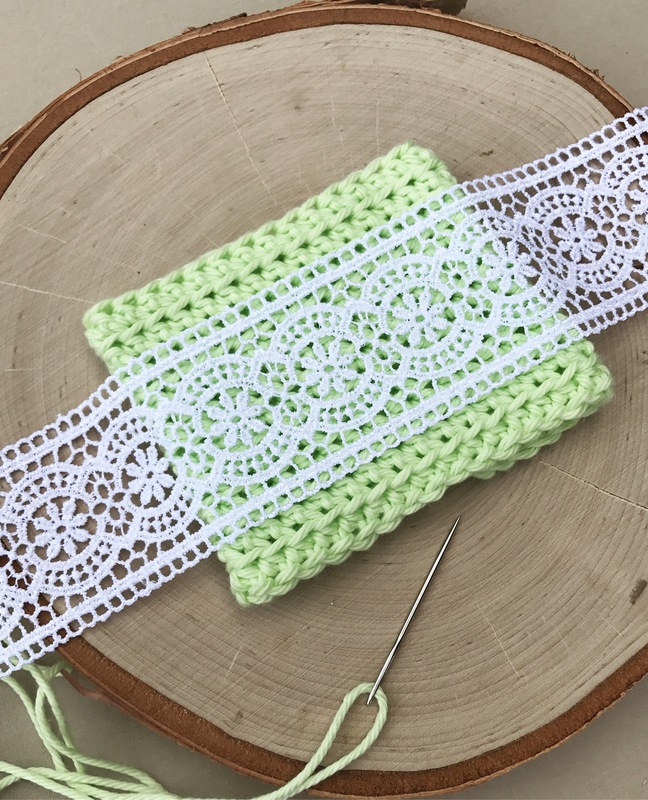 Crochet 10 rounds of HDC BLO. I do NOT chain one before going into the first stitch. I work in a continuous round. 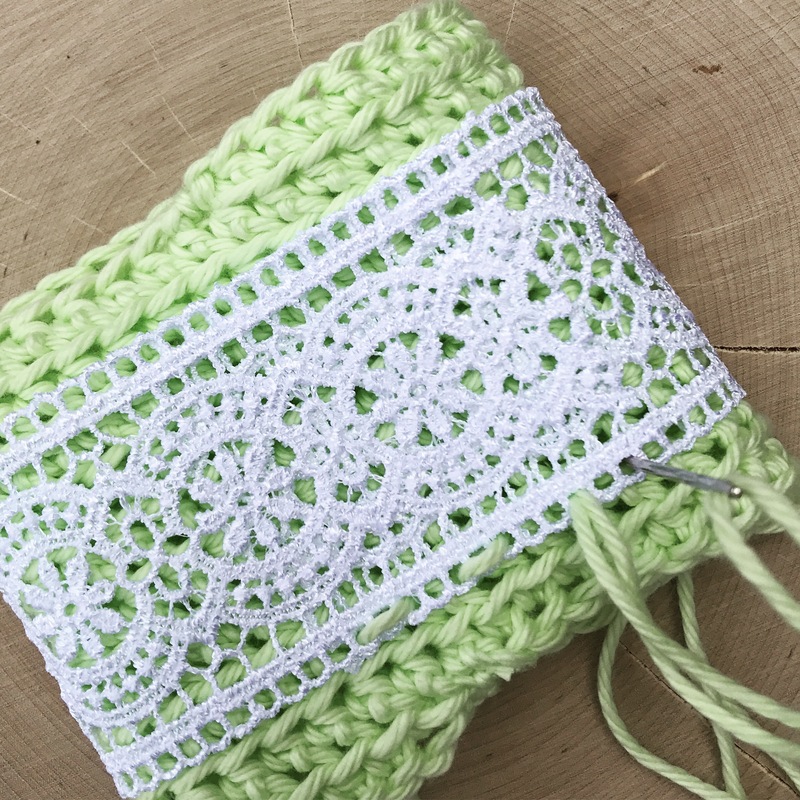 Your crochet should look similar to the photo above. 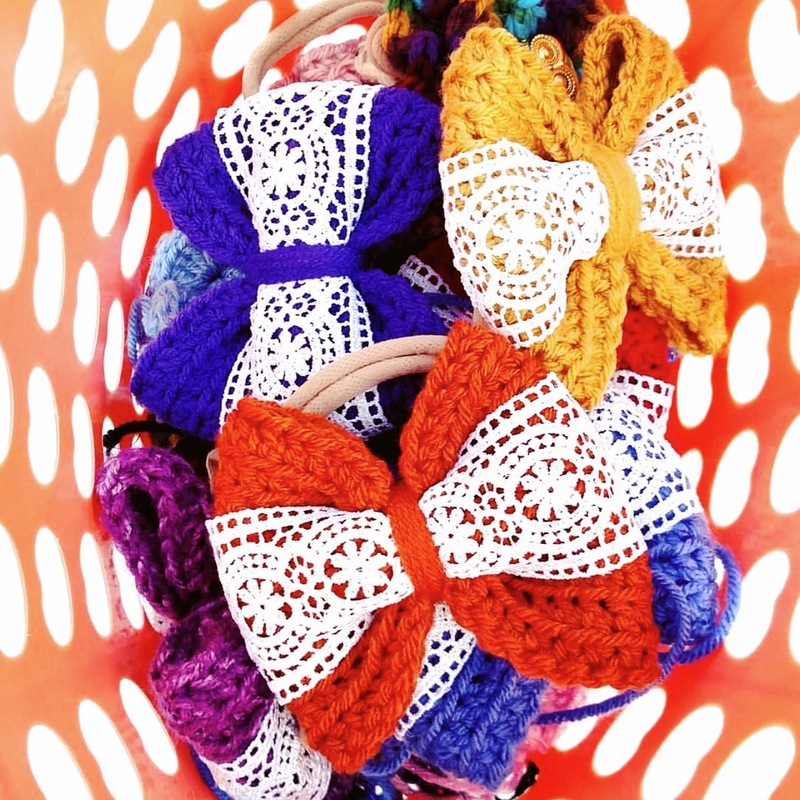 You’ll need the ribbon/lace, a tapestry needle & a long piece of yarn. 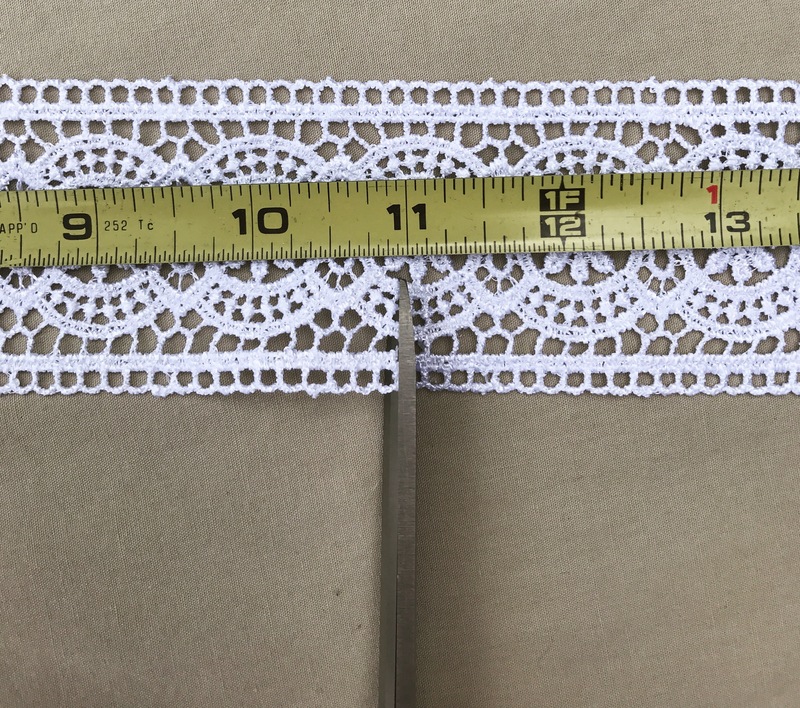 Cut 11″ of lace or ribbon. 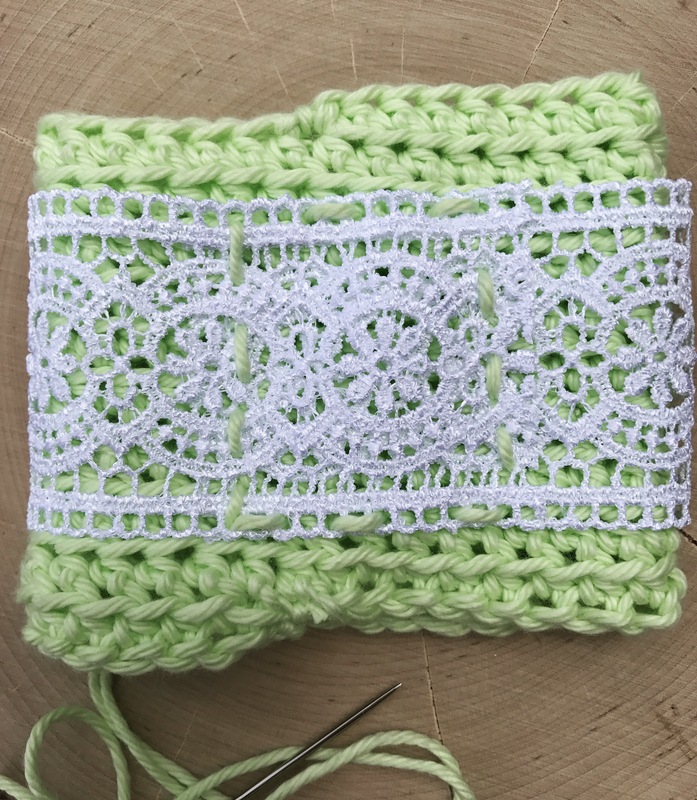 Wrap lace around fabric & turn crochet where the back side of your fabric is facing upwards as shown below. Your lace should overlap about an inch in the back. 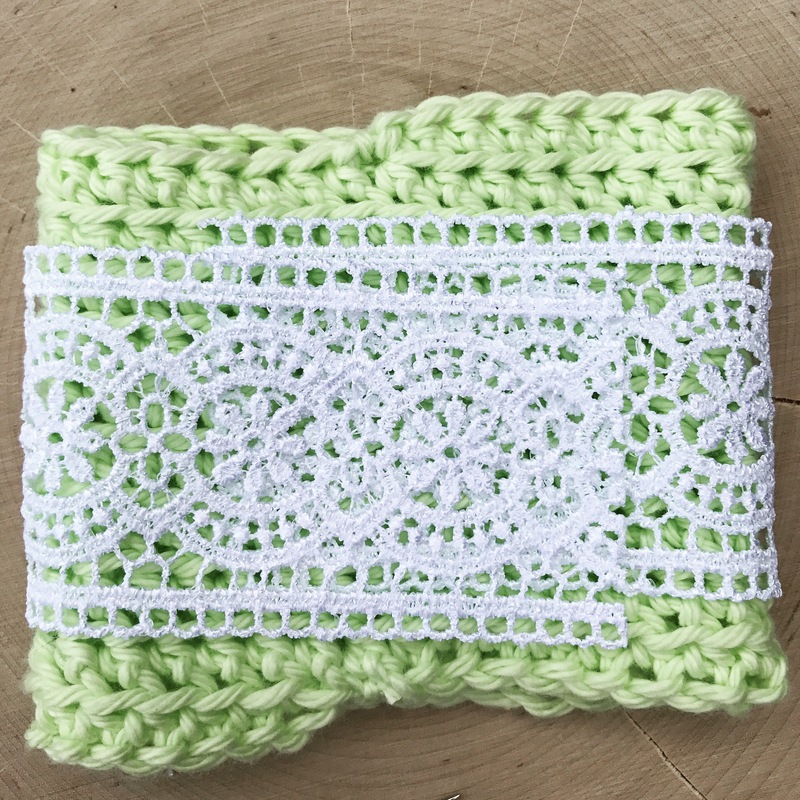 Use yarn needle and yarn to sew a square around the lace as shown below.. 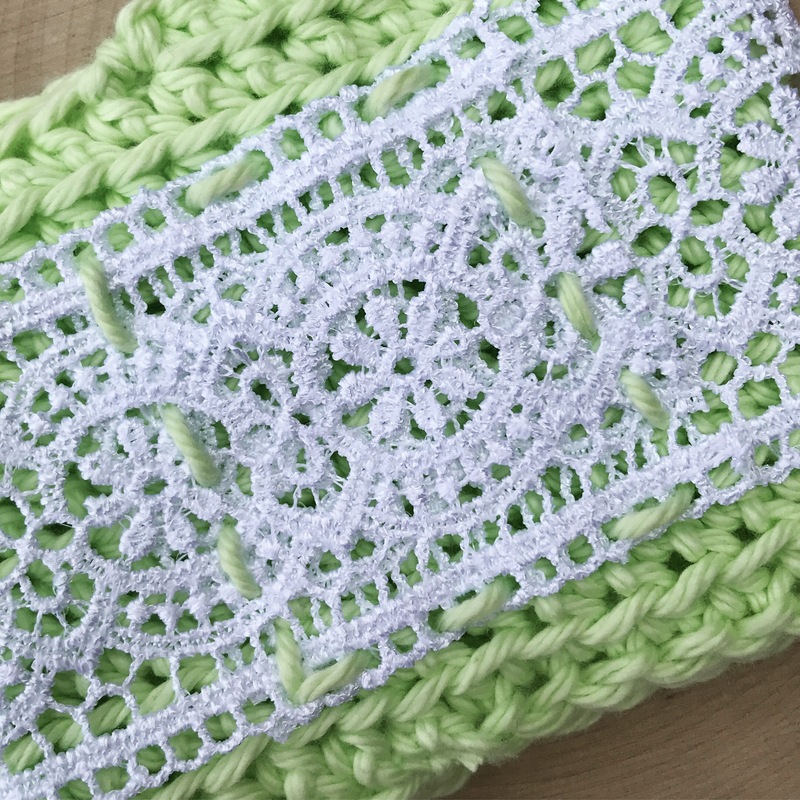 I skip one to two spaces in the lace and work my way around the overlapping lace, sewing in the shape of a square. 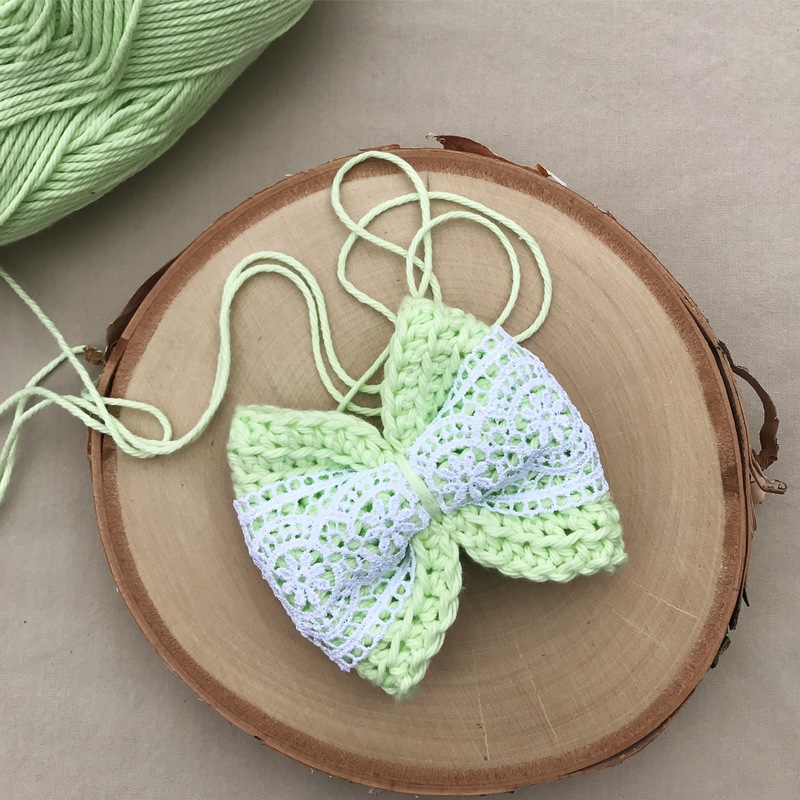 After you complete the square, tie off ends and sew ends into the back side of the bow. 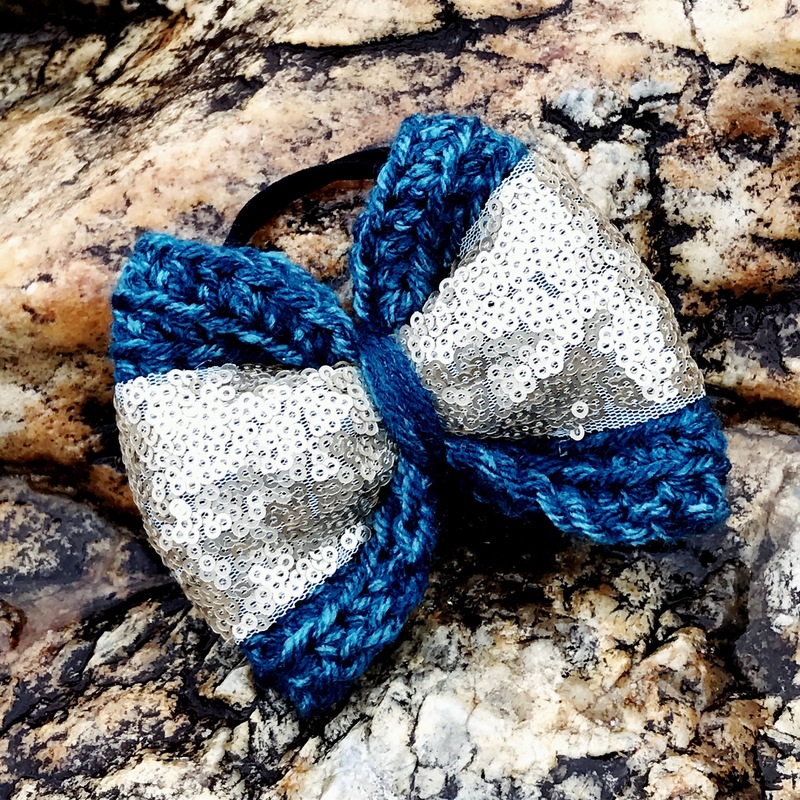 You may want to flip the bow inside out to complete this. Your bow should look similar once completed. 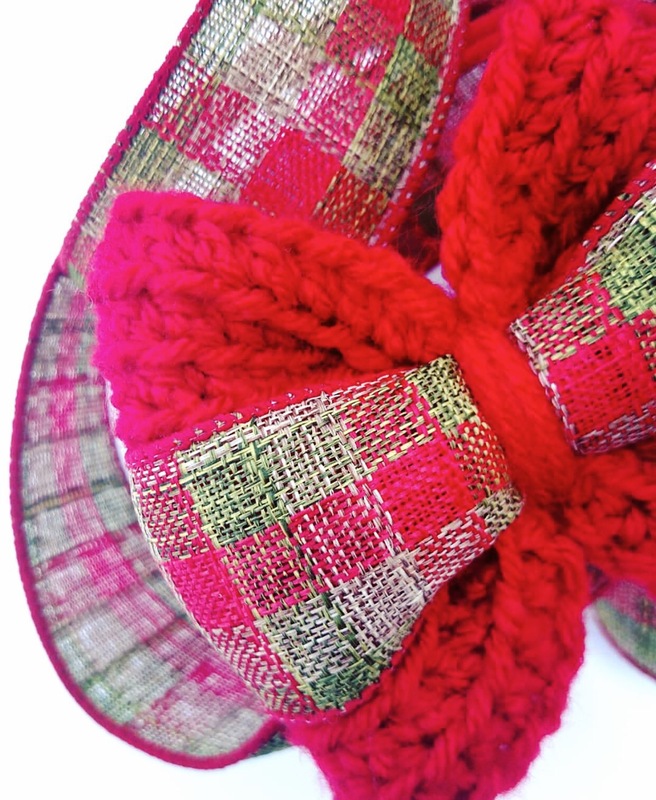 Pinch the center & use a long piece of yarn to tie the bow. After tying together, use the excess yarn to wrap around your nylon band or clip. 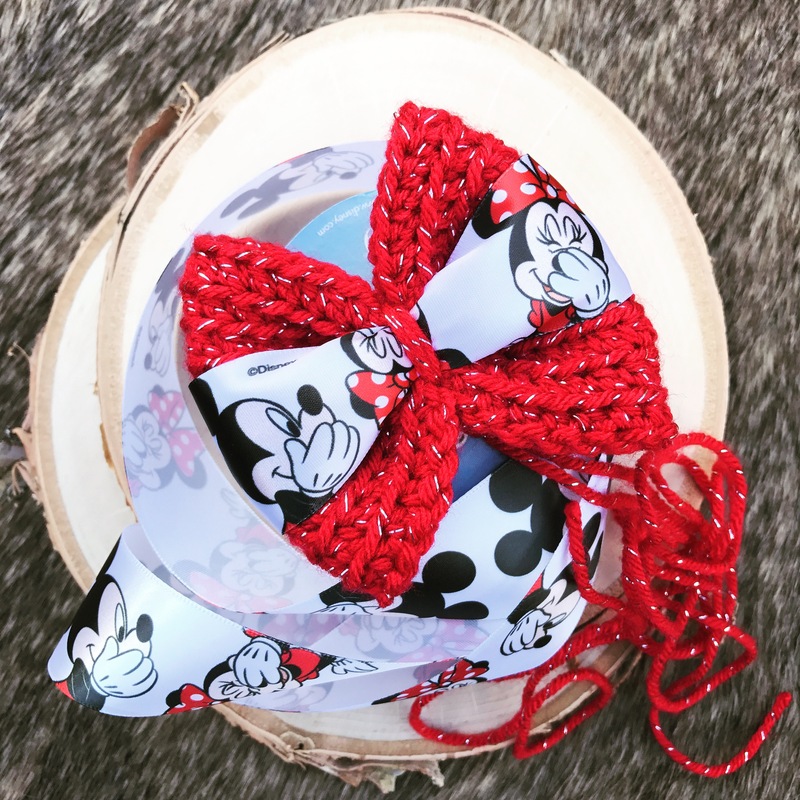 Here are a few of the ribbon bows I’ve made in the past if you need inspiration! 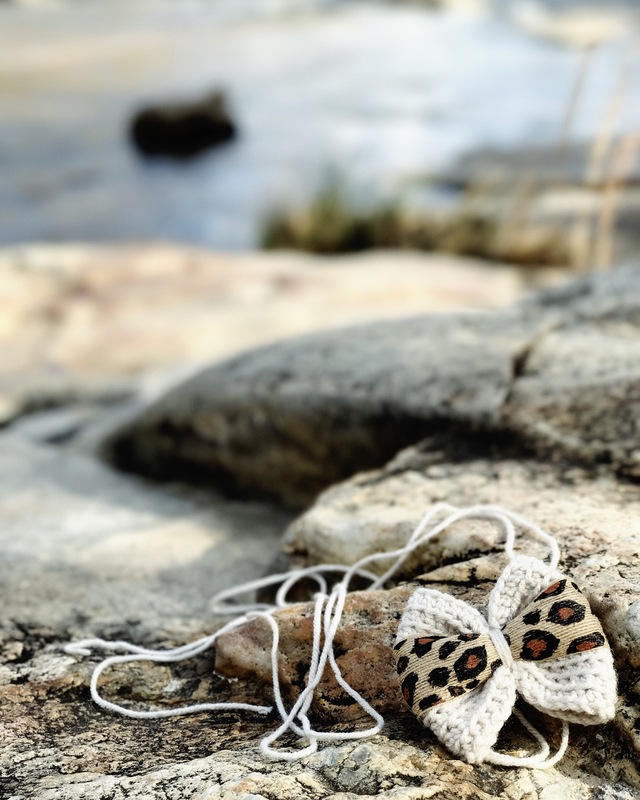 Use an Emma Bow to achieve the look above! 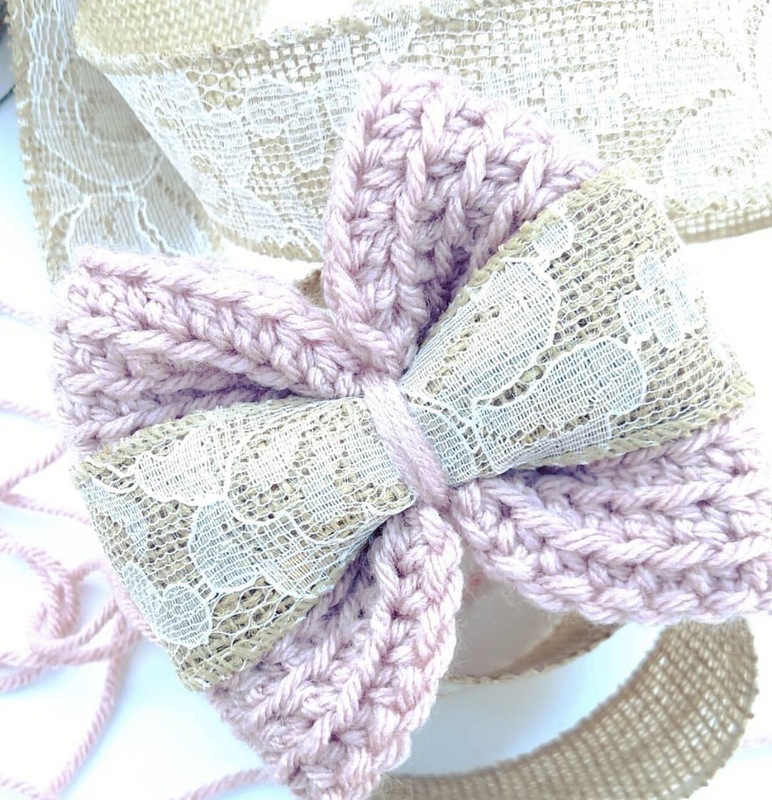 Use a Baby Southern Style Bow to achieve the look above! 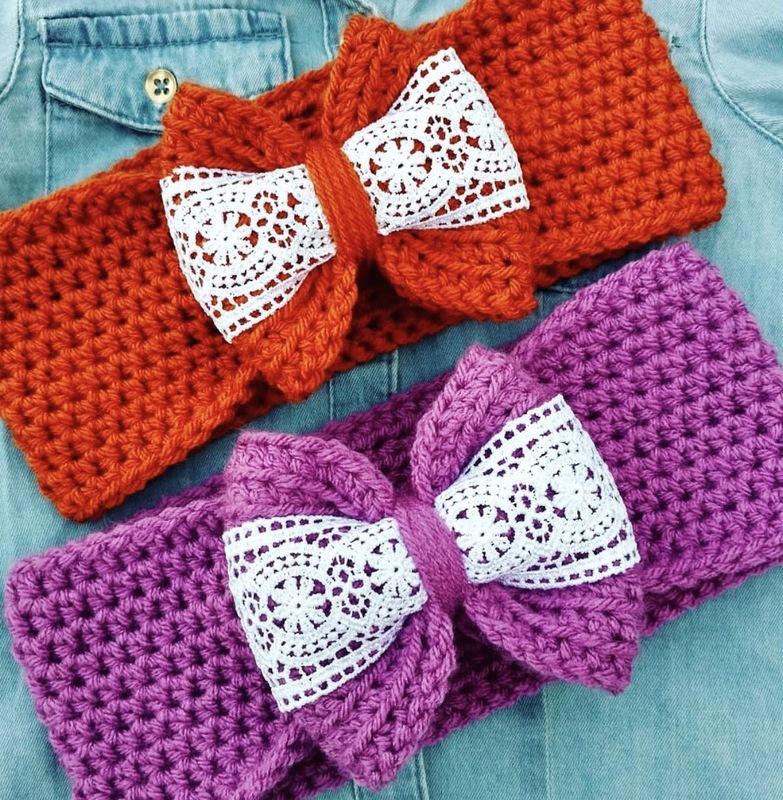 The “Decorative Trim” & “the Ribbon Boutique” were purchased at Hobby Lobby. The “Celebrate It 360” can be found at Michael’s. The Hello Kitty ribbon was purchased at JoAnn’s. All three stores have ribbon departments. Hobby Lobby actually has two! Check near the fabric department and the floral department. Walmart has a ribbon section, also! 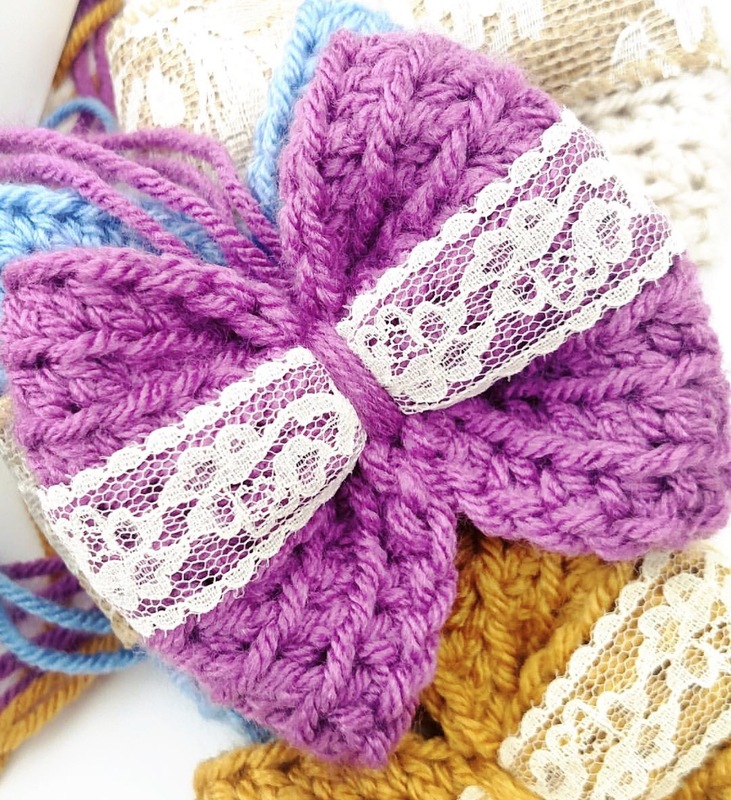 Choose something with openings like the Vintage Lace used for the tutorial for your first bows! They’re the easiest to work with. 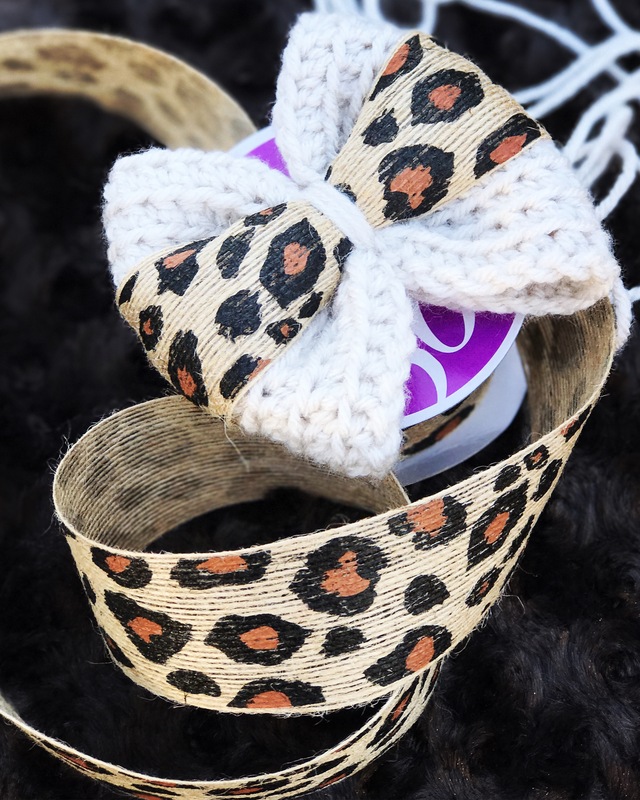 Ribbon with a matte finish works best. A shinny ribbon is much more difficult to apply neatly. Avoid ribbon with wire. It doesn’t work as well, in my opinion. 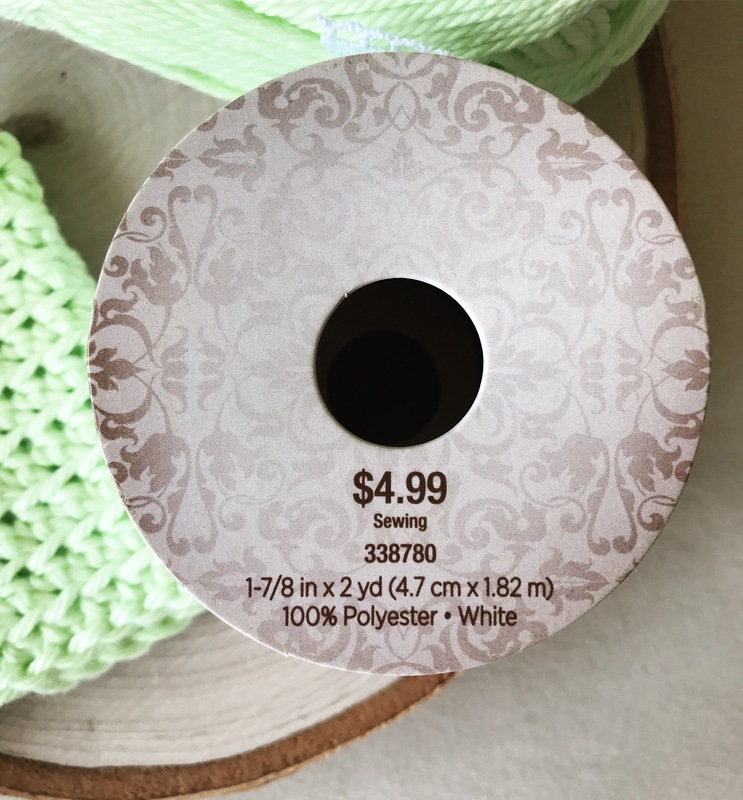 Lace I’ve used for the Baby Bows 🎀 Go with a 7/8″ or 1″ lace or ribbon for best results!